My plus size picks take me back to familiar territory this week - dresses! 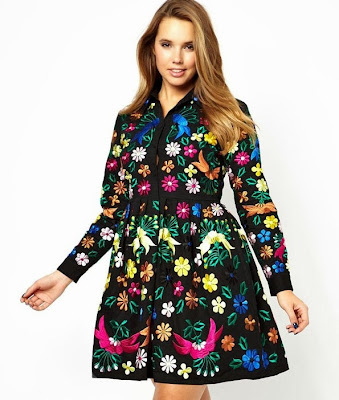 As Autumn descends and we all start to feel the cold, my mind has turned to dresses that will work in cold weather, teamed with boots or closed-toe shoes and thick tights. All of these Wintery dresses will look as good with your wooly opaques as they will with bare legs and strappy sandals, and if needed, you can probably chuck a cardi on top too. Goddiva has recently launched a plus size range, and while the sizes aren't exactly all-inclusive (16 - 24) it's a step in the right direction, and if you like affordable, form-fitting dresses, you may just find something that works and it's definitely one to add to your 'must check' list for stylish plus size designs. This leaf print bodycon number has a very Autumnal feel, and is yours for £55. 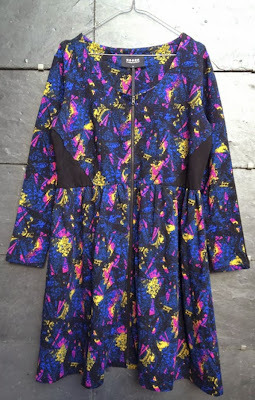 I've had my eye on this ASOS shirt dress (£80, sizes 18 - 26 still available) for a while. All the detail is embroidered, which gives it a really premium feel, and the stiff fabric means it keeps its shape brilliantly. For further evidence that it looks brilliant in real life, see blogger Bethany who teamed it with brogues and black tights. Scarlett & Jo's 'Powerfit' dress now comes in a huge number of different prints, and it's no surprise. This is clearly a hugely successful shape - when I featured the red version it was a big hit, and it's obviously done as well on the Evans website. This new grey textured version (£40, sizes 14 - 28) is a slightly subtler, more sophisticated version of the original 'illusion' dress, and works amazingly to emphasise the waist, bust and other great bits. The Carmakoma Fareham dress (£84.85, up to size 26) is a great buy for Autumn; long sleeves give you a bit of warmth, the zip front allows you to adjust the neckline to suit your body shape, and the black panels (which run all the way around the back) streamline the whole look. This kind of semi-smock shape works with tights, leggings or even skinny jeans if you're tall, and the print is bold without being ridiculously loud. 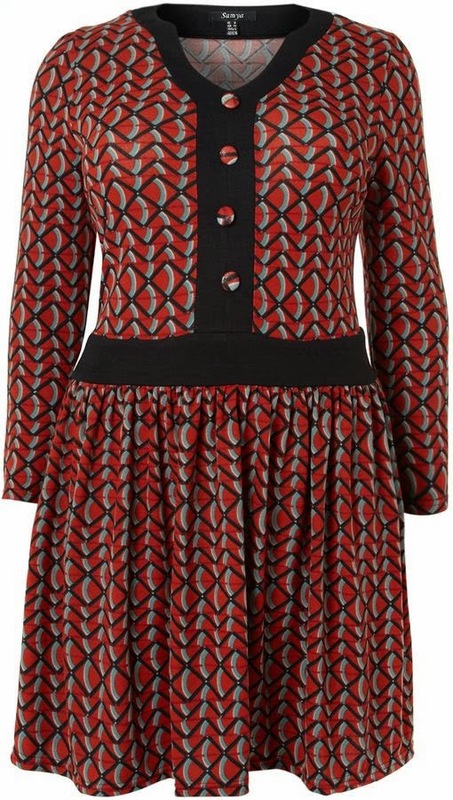 This fab little button detail dress (size 16 - 28) is only £15! Need I say more? It's by a brand called Samya that is well worth a look if you wear a larger size and like a slightly boho look (or a bargain). They have lots of cute little tea dresses and jersey numbers for bargain prices. 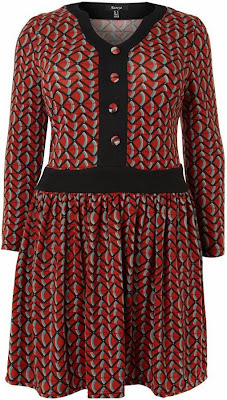 Team this Autumnal dress with thick tights, boots of some description (splash out on a a pair from Duo if regular calf widths don't work for you) and black cardi or jacket for added warmth. These are all too short for plus sized ladies who are over about 5 foot! I'm 5ft 10", size 20 and HATE my thunder thighs! There's no way I'd be caught dead in anything above my knees. Plus sized designers seem to forget some of us are actually big and tall not little round ladies! Hiya - I'll make longer dresses the focus of the next column for those who prefer to cover up a bit more. My friend recently brought some plus sized dresses off Asos, they make her look as wide as she is tall. Skater style dresses or dresses that flair out at the waist are horrific on a plus sized figure unless you actually want to look 5 foot wide. I wish Asos would stop reproducing regualar sized designs in plus sizes and actually looked at the shape of plus sized customers and made more considered approaches. Also, on their site it always says the models are a size 20 but they're clearly more like a 14 on a PMS day. So much more could be done for plus size shoppers as sadly obesity is now a very common disease for woman, myself included. Trying again as I wrote a comment and it disappeared. I like skater dresses, I have several. I think they suit me (size 22, 5'10"), possibly because I'm tall and more or less hourglass shaped. The wider skirt balances my bust and skims over my thighs. The problem is that plus sized figures are more variable than smaller sized. Or rather, the variations that we all have compared to a 'standard' size become more obvious. It comes down to a lot of trial and error and knowing what shapes work for you. The ASOS shirt dress has POCKETS! Oh wow! Put on Your Pearls Girls! Sting in the Tail: Booze for your Bath! We're hiring! Are you our next writer?